The service charge is based on .03 €/DEC®-block(=DOS-sector) - any modifications may be caused by very large or numerous particularly short files, source by other O/S than RT-11® (so far e. g. Files-11/ODS-1 by RSX®, IAS® and VMS®), poorly readable source, target verify, target duplicate, source duplicate, target subdirectory or any extra effort else. Up to 10 Mbytes (equals 20 Kblocks) of plain simple data can be copied and returned immediately. Directory hardcopies of all involved volumes are part of this service. The least order size is 120 € (corresponding to 2 Mbytes). Sorry, this data conversion service is no longer availabe. However, the website will remain online for infinite reference. ... is what the conversion utility "brxDOS" allows - while running on the Q-bus® controller BAYDEL BRX50® with up to 2 SA450-type diskette-drives connected to it. With 5¼" or 3½" diskettes, it can list directory, show disk type, read/write attributes/files/volumes, rename, delete, initialize and format for MS®-DOS, TSX-32®, OS/2® or ATARI ST® - everything under RT-11®, TSX-Plus® or SHAREplus®. The program is comfortable. First of all, it is self-explanatory and files may be named the wildcard manner. It has convenient defaults. In addition, it is particularly safe: Incompatibilities between MS®-DOS file names and those of RT-11® are recognized automatically and no imaginable user impact will corrupt data accidentially. 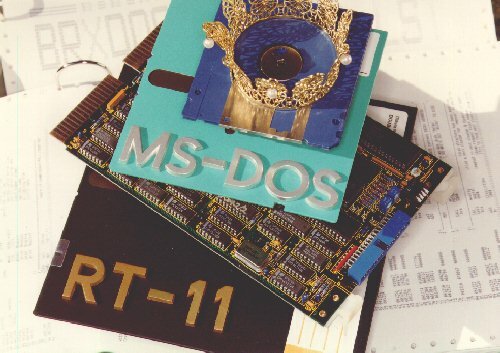 Through this product, network installations and time wasting protocol transmissions become unnecessary for the quick file transfer between MS®-DOS and RT-11®. You could download the full reference documentation including a runnable demo from CompuServe "GO PDP11" Library O - as files BRXDOC.TXT and BRXDEM.SAV or even more - all under the keyword "BRXDOS", before CompuServe abolished this forum by mid of April '98. This package did not yet know the VFAT file system (long file names of Windows®95), as the available product does. Also, the distributed product has been upgraded to be Y2k compliant, while the demo package did not yet. So far, the documentation is available here as PDF file. A short-form description in PDF is available for download (in German).